The refueling floor of Unit 4. The yellow object is the drywell head, which has been moved from the top of the drywell during refueling. The green objects on the right are parts of the refueling bridge. The earthquake and tsunami that hit Japan mid-afternoon Japan time (early morning in the U.S.) on March 11 led to a shutdown of the reactors and loss of emergency cooling at the Fukushima Dai-Ichi nuclear facility. Seven weeks later the situation at the facility has improved and stabilized relative to the crisis in the first few weeks, but serious difficulties remain. A better description is that the situation has become less unpredictable than it was. As noted in my 3-week update on the Fukushima crisis, concern is focused on the fuel in the reactor cores at Units 1, 2, and 3, and the spent fuel in cooling pools at Units 1, 2, 3, and 4. While details of the damage to the nuclear fuel at the site are not known, it appears that more total fuel damage has occurred during this accident than all previous reactor accidents combined. Nuclear fuel consists of uranium fuel pellets encased in a tube made of zirconium metal alloy, known as the cladding. Fuel damage caused by lack of cooling results when the fuel gets hot enough that the cladding balloons and ruptures, which releases radioactive gases from the gap between the fuel rod and the cladding. As the temperature increases the cladding can begin to burn by reacting with steam. This produces hydrogen, which can explode if the concentration becomes high enough. If the temperature increases further, the cladding can melt, and eventually the fuel pellets themselves can melt, which releases larger amounts of radioactive gases. If molten fuel or fuel debris from a broken fuel rod relocates within the reactor core it can cause additional problems, including burning through the bottom of the reactor vessel. The hydrogen explosions and release of radioactivity at Fukushima are evidence of rupture and burning of the fuel cladding in some of the reactors and spent fuel pools. There is speculation about fuel melting and relocating, but this can’t yet be confirmed. The Fukushima accident has been rated at the highest level (7) of the International Atomic Energy Agency scale used to rank serious accidents; the Chernobyl accident also is rated as a 7. (A detailed manual about the INES scale is available here.) Each level differs from the previous level by a factor of 10 increase in the amount of radioactive iodine-131 (I-131) released to the environment. Due to the failure of containment structures in the Chernobyl reactor, all of the I-131 released from fuel damaged in that accident went into the atmosphere, while containment in the Fukushima reactors has allowed only a fraction of the I-131 released from the fuel to escape. The Three Mile Island nuclear accident was rated as a 5 on this scale. An initial estimate by the Nuclear Safety Commission (NSC) of Japan of the amount of I-131 released to the environment by the Unit 1, 2, and 3 reactors at Fukushima over the period March 11 to April 5 is less than, but within a factor of ten of, the amount released at Chernobyl. The NSC estimate of 150 peta-becquerel (1.5 E17 becquerel) is preliminary; our estimate is that this corresponds to roughly 2.5% of the amount of total amount of I-131 in the fuel in the 3 reactors at the time they shut down. Because I-131 is created by fission reactions in the fuel and starts to decay quickly (with a half-life of 8 days), once fission is no longer occurring, the fuel in the spent fuel pools at Fukushima would not contain significant amounts of I-131. The short half-life also means that the amount of I-131 in the reactor cores at the time of the earthquake has now decayed by a factor of 80 so that the I-131 that was released to the environment is disappearing, and the amount remaining in the reactors that could be released is also dropping. Another main health concern is radioactive cesium-137 (Cs-137), which has a 30-year half-life and will therefore remain a problem for several centuries. In late March, workers discovered very highly contaminated water in the basements of the turbine buildings and in trenches under the reactor buildings of Units 1, 2, and 3. The amount is estimated at nearly 70,000 tons of water. The water outside the reactor buildings came primarily from a crack in building 2. That water was said to have a very high radiation level—1 sievert/hour at the surface of the water—which is high enough to cause acute radiation sickness after a short exposure. Some of that water flowed into the ocean for a period of at least a week before the leak was fixed. As a result, this water led to significant contamination of the ground around the reactors and of water off the coast. To move the highly contaminated water in the turbine buildings and trenches into containers, workers had to empty containers that were already full of less radioactive water, and dumped 10,000 tons of this less radioactive water into the ocean. Some sources have said that the ground around the reactors was also contaminated by fuel dispersed by the March 15 explosion in the Unit 4 spent fuel pool. That explosion is believed to have been caused by hydrogen produced by spent fuel that overheated when the pool lost water and exposed the fuel rods. The uncovering of the fuel that early in the crisis suggests a significant leak in the pool since the water could not have boiled away that quickly. This leak is continuing to complicate efforts to keep this fuel cooled. 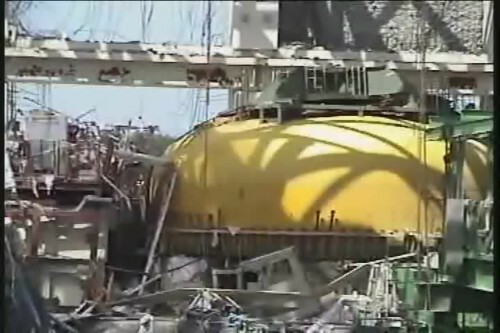 Some reports say the March 15 explosion blew highly radioactive pieces of fuel out of the pool and onto the ground between the reactor buildings and these pieces had to be bulldozed over to reduce health concerns. They also say the explosion was responsible for bits of fuel that were discovered up to a mile away from the reactor. There has been concern that this explosion may therefore have caused significant damage to the fuel remaining in the pool. 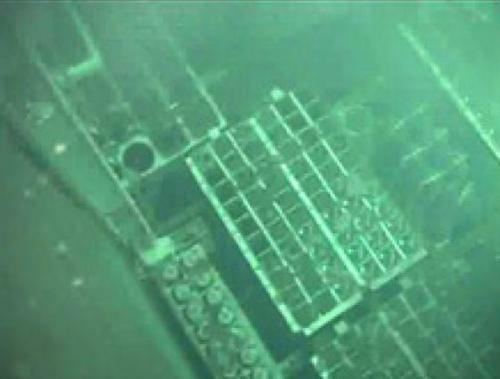 However, a short video taken on April 28 by a camera under the surface of the water of the Unit 4 pool seems to show undamaged racks and fuel assemblies (see photo below). No severe damage to the fuel is evident in the video, but it shows only a small fraction of the spent fuel in the pool. More information is needed to understand what really happened in pool 4. For example, if the fuel particles found at long distances from the pool were small enough, crumbling of damaged fuel could have created the particles, which were then lofted by the vapor rising from the pool and carried away by the wind. Their presence may not necessarily be related to the explosion. A picture of some of the fuel assemblies in the spent fuel pool at Unit 4. The Japanese government announced an evacuation zone out to 20 km around the plant within a couple weeks after the accident, but it did not enforce evacuation from this area until last week. An estimated 80,000 residents have been displaced by this evacuation, which is expected to last for at least 6 to 9 months while the reactors are stabilized and the evacuated areas are decontaminated. In late April the government extended the evacuation to certain areas up to 30 km from the plant, an acknowledgment that significant levels of contamination were present well beyond the original evacuation zone. On May 2, Japan announced that it had detected relatively high levels of Cs-137 in the sludge from a waste water treatment plant in Koriyama City, Fukushima Prefecture. It believes rain washed contaminated soil into the sewer, and that the Cs-137 was concentrated through processing of the waste water. One concern is that this sludge is shipped from the treatment plant to make cement, so past shipments are being checked for contamination. The solidified slag made from it reportedly contains 0.3 mega-becquerels per kilogram, said to be 1,300 times the level before the accident, and would classify it as low-level radioactive waste. Currently all of these reactors and pools are being cooled, although normal cooling systems have not been restored. They will require active cooling for many months or years because of the high levels of radioactivity in the fuel they contain. Workers are now able to inject fresh water directly into reactors 1, 2, and 3 and into spent fuel pools 1 and 2. However, they are still shooting water toward the spent fuel pools at Units 3 and 4 from a long pipe connected to a truck to keep water in the pools. The normal cooling system for the spent fuel pools features continual “overflow” collecting in a small open tank. The fuel pool cooling pumps pull water from the tanks and send it through heat exchangers and filter demineralizer units to cool and treat it before returning it to the pools. The hydrogen explosions have reportedly severely damaged the normal cooling systems. In addition, the apparent leak from the Unit 4 spent fuel pool would prevent maintaining a stable water level needed for the “overflow” cooling system to work. There remains a concern about parts of the fuel cladding becoming hot enough to combust and produce hydrogen, which could lead to an explosion in the reactor vessels or primary containment. One way to prevent an explosion if hydrogen is being produced is to pump nitrogen into the containment vessel to force out any remaining oxygen, which is needed for an explosion. Even if a flow of cooling water to the reactors and pools is restored, adequately cooling fuel that has been damaged is complicated by the fact that ballooning and buckling of the fuel rods can block the flow of cooling water around them. Sections of the fuel rods may become hot enough to continue to sustain damage, including melting parts of the fuel. Melting can release large amounts of radioactive gases that are trapped in the fuel. Moreover, if the melted fuel starts to move around in the reactor vessel, enough may collect in one place to become critical and start a local nuclear reaction. While there has been speculation that melted fuel may have collected in the bottom of reactor vessel 2 and possibly even eaten through the vessel or otherwise leaked out, there is no confirmation of this. Monitoring inside the reactor buildings of Units 1 and 3 has shown that radiation levels are too high to allow workers inside to attempt repairs (measurements in Unit 2 were inconclusive). This has set back plans to improve the cooling systems for these reactors and begin to remove debris. Remote-controlled wheeled robots bearing cameras have been used to enter the highly radioactive reactor buildings to assess conditions. These robots have beamed back images of local instrumentation readings and of penetrations through the primary containment walls. Over the past week or two, workers have been pumping nitrogen into the primary containment vessel of Unit 1. This concern about the presence of hydrogen implies there is also concern that fuel damage is still occurring. This measure is also being considered for the reactors at Units 2 and 3, but Unit 1 has had a higher temperature and pressure and is getting attention first. However, it is not clear why this preventative measure is not being taken at Units 2 and 3 at the same time it is being done at Unit 1. To attempt to deal with ongoing concerns about the Unit 1 reactor, the Tokyo Electric Power Company (TEPCO), which owns the Fukushima plant, decided to try creating what some are calling a “water sarcophagus” by flooding the primary containment (torus and drywell) to fill it with water to a level above the fuel in the reactor core. This flooding is apparently nearing completion. The goal of the flooding is to make sure the fuel is covered by water, since efforts to fill the reactor vessel with water above the level of the fuel have apparently not been successful. However, it may not be effective in cooling damaged fuel and there is concern that the additional stress on the containment walls due to the weight of the water would make the containment more susceptible to rupture if a strong aftershock hits. Moreover, if there are leaks in the containment this could lead to an increase in contaminated water in the reactor or turbine building. The primary containment of Unit 2 is thought to have been damaged by the explosion that took place in the first few days of the crisis. Similarly, workers are concerned that the containment vessel of Unit 3 may have a crack and may also be leaking. If this is true, TEPCO will not able to fill these with water as it is doing with Unit 1 without first repairing them. One report states that more water than the volume of the containment vessel has been pumped into both Units 2 and 3, which would imply that water is leaking out. On April 17, TEPCO announced a 9-month plan to stabilize the situation at Fukushima, bringing the reactors into cold shutdown, stopping the release of radioactive materials from the plant, and remediating the surrounding environment. The first phase—estimated to take 3 months—is to build new cooling systems for the reactors, since TEPCO has decided that the old cooling systems cannot be restored and made to work. While that is underway the current makeshift cooling methods, which have led to releases of radioactive gas and water to the environment, are expected to continue. A few days ago Japan announced that it hoped to have a water treatment facility to decontaminate water operating as early as June. Such a system would allow workers to develop a cooling system that recirculates water from the reactors and the cooling pools.